Dresden is a gem of a city located on the Elbe River and is full of historical attractions that are worth visiting any time of the year. It is an extra treat for the eyes and scenses between the end of November and until Christmas. 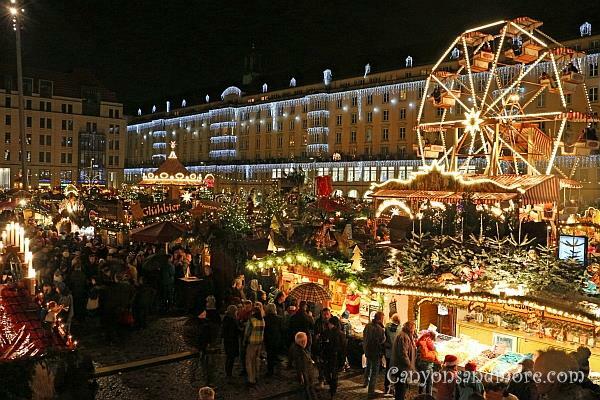 Then the city is festively decorated and several Christmas markets can be found throughout the city. 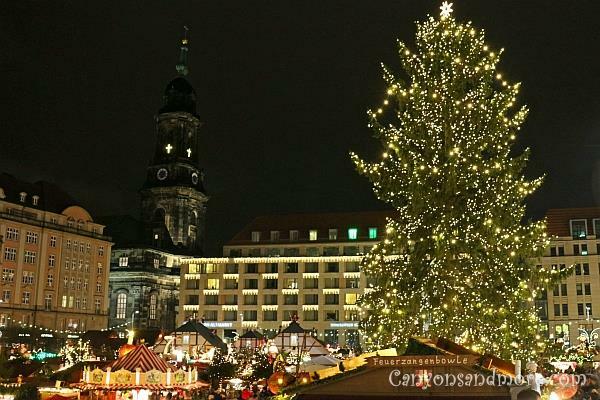 The main Christmas market is called the “Striezelmarkt” and the year 2014 was the 580th time that this market took place. 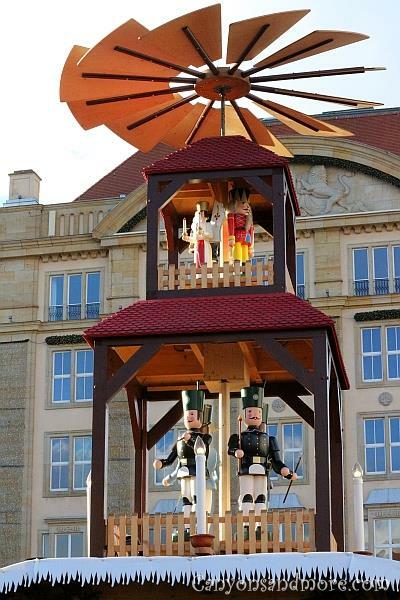 It is found at the “Altmarkt” (old market) of the city. 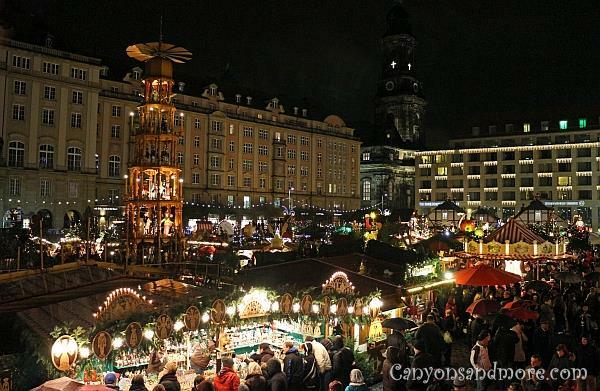 The image above shows the “Striezelmarkt”, which is the oldest Christmas market in Germany and dates back to 1434. This image is made from the entrance on the beautiful wooden arch located there. It is possible to go onto this arch and see the market from a higher location. This view is towards the left of the market. The famous pyramid, which is over 14 meters high, proudly overlooks the market. 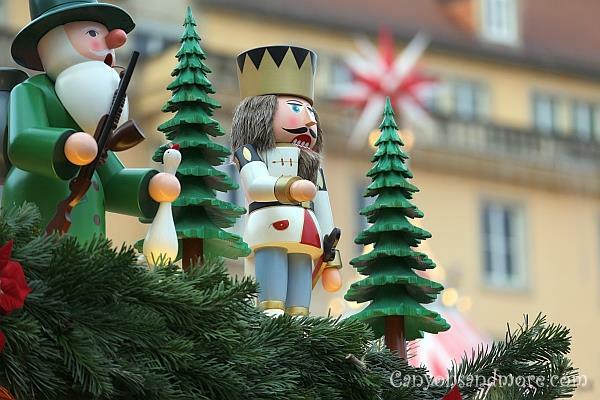 The wooden arch at the entrance of the market is decorated with charming “Erzgebirge” (Erz Mountains) wooden figures which are of high quality and handcrafted in this area of Germany. Many booths at the market sell such figures and there is a possibility to watch a craftsman at the market make such figures as well. 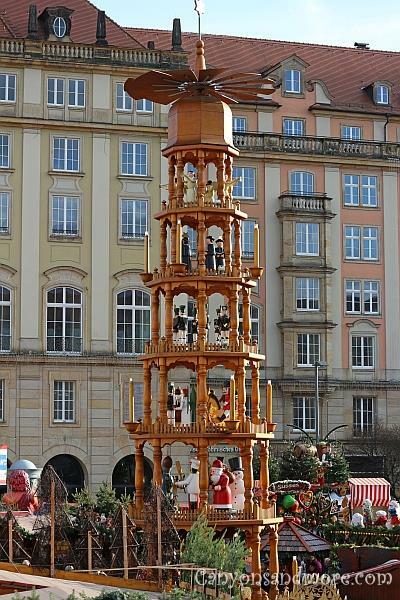 Six tiers of “Erzgebirge” (Erz Mountains) wooden figures adorn this beautiful pyramid and is a highlight of the market. A gorgeous tree at the center of the market is illuminated with what looks like thousands of lights. 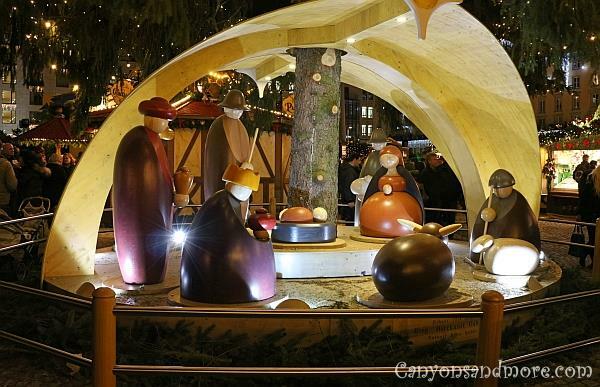 Located at the bottom of the tree is a wooden nativity crafted in the typical style of the area. The “Kreuzkirche” (Church of the Holy Cross) overlooks the market In the background. Church bells can be heard regularily which adds a beautiful sound to the market. The illuminated crosses in the tower were lit up on a Sunday of the Advent season. On the remaining days, the crosses remained dark. This is the view of the market when standing on the wooden arch and looking left. Christmas music fills the air and the market is a great meeting place for locals to meet up and chat over a mug of “Glühwein” (mulled wine) and local culinary specialties. Tourists from all over the world visit the market to enjoy the atmosphere and purchase local handcrafted Christmas decorations and ornaments. A smaller pyramid is located on the roof of one of the booths at the entrance of the market. 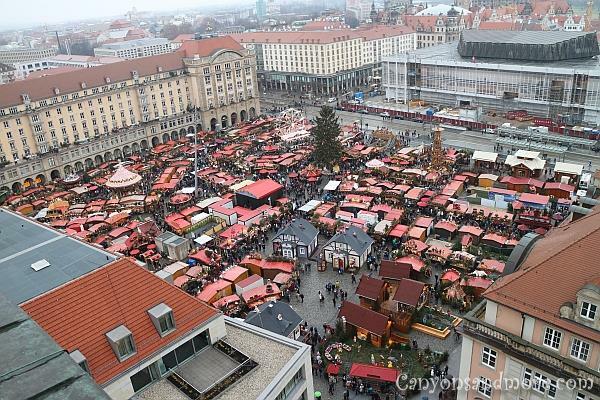 This is a unique view of the Christmas market. For a small fee, you can take an elevator up in the tower of the “Kreuzkirche” (Church of the Holy Cross) and get a lovely 360° view of Dresden from above during the morning and afternoon hours. On this particular day, it was gloomy and raining. But the view was impressive just the same. This is the natitivy at the bottom of the Christmas market tree. The graceful style of the wooden figures is typical for the area. So much love and attention to detail are given to the handcrafted “Erzgebirge” (Erz Mountains) wooden figures at the market. 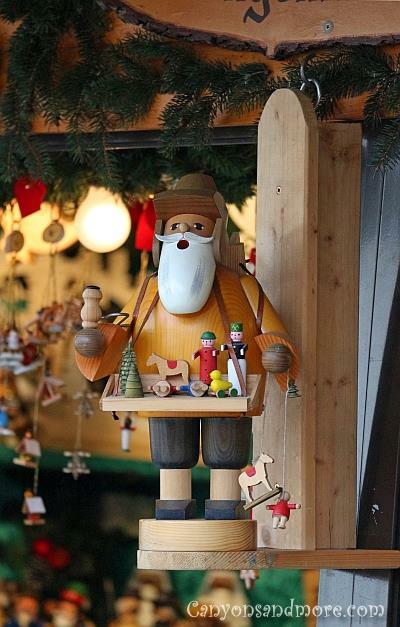 A handsome wooden nutcracker decks the top of one of the stall of the market. If you have the time while at the market, take a look at the rooftops of all of the stalls. Each one is lovingly embellished with Christmas scenes using all sorts of materials and often keeping with the theme of the stall itself. A stall selling teddy bears used bears to adorn the roof while a stall selling “Lebkuchenherzen” (similar to gingerbread hearts) used replicas of these hearts to decorate theirs. 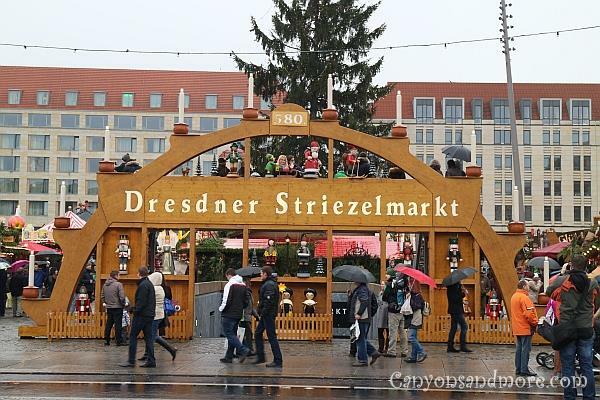 Find even more information about the Dresden Stiezelmarkt at the Dresden.de website. The information is written in English.